Colour is hard. Let’s just get that out of the way first. If it wasn’t, there wouldn’t be so many competing colour theories around – both the useful ones and the ones that, at times, border on the ridiculous. There also wouldn’t be so many arguments about colour on art forums. And there’d be a lot less frustration in artists’ lives – and less bad paintings. One of the most basic challenges of colour is being able to match the colours you see. In fact, I think it’s the most basic challenge, so it’s the one I’m going to address in this post, with a useful little exercise in colour matching. Before I go any further, I should make clear that there are some colours that you simply can’t match. And some you can but you’ll really struggle with. Sometimes, a colour is just difficult to judge. With very low chroma colours (i.e. colours very near to grey) it can be extremely difficult to decide what the hue is. If you can’t match colours, you’ll really struggle to be able to paint realistically. But more than that, the practice of trying to match colours as exactly as you can develops your sensitivity to colour. Many of the colours we see are much closer to grey than we think, and they can create incredibly beautiful and subtle harmonies. 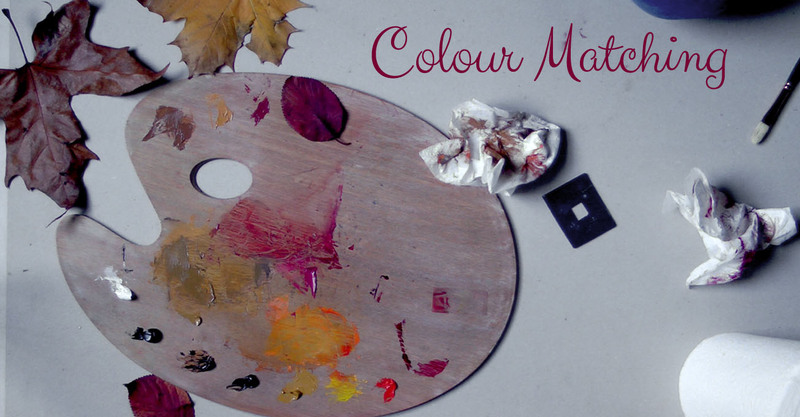 In this post, I hope to show you one way you can simplify the job of matching colours. It won’t necessarily make it easy, but it should make it less difficult, and it will certainly make it more possible for you if you struggle with matching the colours you see. Why is it hard to match the colours we see? Our propensity to label colours mentally by the local. We call something white even though it appears perceptually as a dark grey. Check out this post for a little more on that. Various esoteric colour theories and obfuscating dogma that have grown up over the years (warm and cool etc) just throw us off without getting us any closer to understanding colour. Instead of being able to think clearly about colour, we tend too often to think magically and romantically about colour. The romantic names of our tube colours really don’t help. Madder lake. Burnt Sienna. Naples yellow. Raw umber. They just don’t give us any useful information about the hue of our tube colours. I’d rather they called burnt umber “really dark orange” because that’s what it is. Often, it’s difficult to judge the colours we see because they’re in the context of other colours, surrounded by other colours that affect our perception of them. When we paint, we often have our palettes in different light to our easel, and different again to the light our subject is in. So you might mix what you think is the colour you see of, say, a lemon, on your palette, only to find that when you place it on your canvas, it’s entirely too light, or too dark. The limited value range of our materials. We generally can’t get near the value range we see in the world with paint, which means that even if we manage to match a local colour, we’ll have to do some serious translation to be able to paint the colours we see. More on that here. It’s a wonder we manage to get even close to the colours we see, given all that. Too often we get into a kind of hunt-and-peck approach to matching a given colour, get something we think is somewhere near (although often is nowhere near at all) get frustrated and stick what we have on the canvas, thinking it’ll be close enough. Chances are, it won’t be. And the thing we’re painting won’t look real. Or pretty. 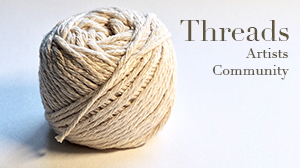 Find a practical, effective approach that circumvents as many of the issues above as possible. Practice it until our eyes ache and we’ve worn a hole in our palettes from all the mixing we’ve done. Sorry. But I didn’t say it was going to be easy. Just that I was going to try to help you get better at it. So I’m going to give you my version of the first one. It works well for me. I hope it will for you. The second one is up to you. Value: How light or dark it is, i.e. whether it is closer to white or black. Chroma: How bright it is, or how far it is from grey. A colour with low chroma is very close to grey. A colour with high chroma is far from grey – the colour of an orange, say, is high chroma. Yes, I’m talking about Munsell. Pick a near starting colour. Pick a tube colour that is at least near to your target in terms of hue, if you can. It’s generally better if it’s higher chroma, too, because it’s easier to reduce chroma than to increase it. Match the value. Now take that colour, and either darken it or lighten it until it’s the same value as your target colour. Don’t worry about anything else, just match the value. You’re generally better off darkening a colour with a lower value version of the colour you have. If you’re trying to match an orange colour, say, you might start with cadmium orange and then darken it with burnt umber. Because burnt umber is orange. If you darken it with black, you’re effectively adding purple-blue so you’ll drastically affect the hue and chroma as well. If you need to lighten it, use a lighter version or white. Check the hue. You can generally see, if you’re fairly close, which direction around the hue wheel you need to move your colour in order to match the hue. If you’re matching an orange, you might need to swing it more towards red, or towards yellow. In either case, mix up a colour of the same value as the colour you have, and then mix the two together, bit by bit, until you hit the hue. It’s really important that you keep the value constant, or you’ll have to start again! Check the chroma. If the colour is too high in chroma (which it usually will be) you can reduce the chroma with a neutral grey of the same value. Again, it’s really important to keep the value constant, or you’ll be back to square one. Once you have the chroma right, you should be really near. Chances are though, that your hue will have drifted out a little by now, and you’ll need to adjust it. Don’t settle, adjust it. Get as close as you can. It’s in those last, fine adjustments that you really stretch your sensitivity. Pushing yourself beyond your usual is what helps you grow. Because this stuff is easier to see than to read about, I recorded this little demo the other day. I’m trying to match the local colours of some leaves. And talking whilst I do it. Which frankly, I struggle with. But hopefully, it’ll go some way to demonstrating how thinking about colour in terms of those three dimensions can help you get closer to a target colour with less fuss. In this video, I actually started with lower chroma versions of the colour and had to mix higher chroma versions to bring them up. I recommend you do it the other way, start with high chroma and bring them down. But either works. If you’re used to thinking about colour in terms of hue, value and chroma, there won’t be anything new for you in this video. But if that idea is new to you, you might pick up a more effective approach to colour matching. 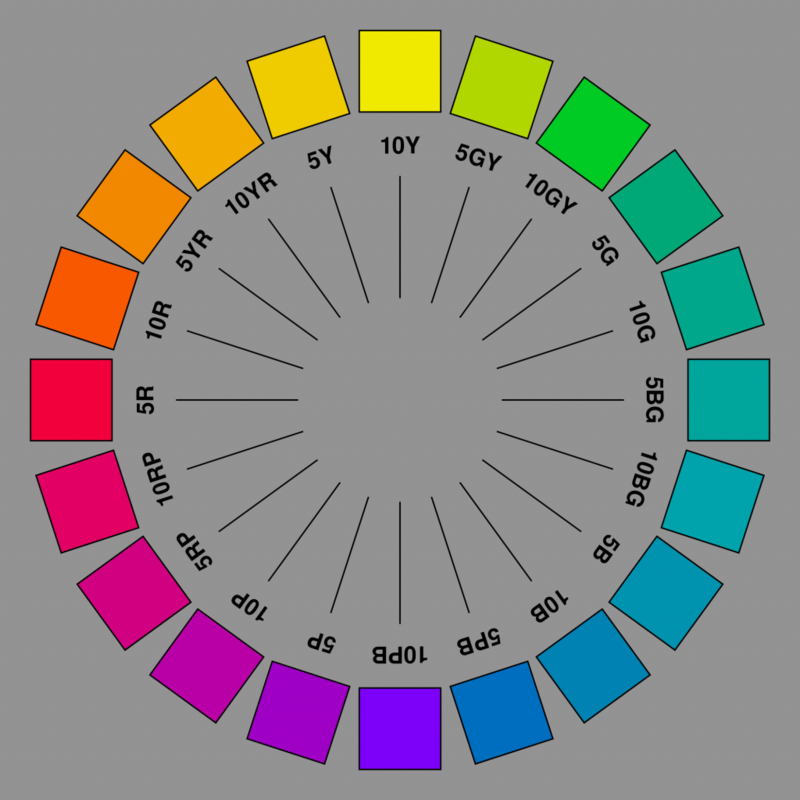 Here’s the Munsell hue wheel. It’s slightly different than the one we learned at school based on primaries and secondaries. But it works fine. Have a go at this. Choose some local colours around your house, or some flowers, leaves, anything. Then try this exercise a few times. I think you’ll be surprised by how much you learn from just trying to match a few. The great thing is that the skill you develop with this simple exercise will translate directly into your paintings, with time. You’ll find it easier to judge what colour it is you’re seeing. You’ll find it easier to match it. And – at least I’ve found this – your enhanced sensitivity to the subtleties of colour will help you to create more beautiful and less vulgar harmonies in your work. Thank you Cerise! I’d love to put the best bits together in a book, but the amount of work involved daunts me, I must admit. I can’t imagine how I’d find any time to paint! I wish art school had been this informative. Thanks so much. Thank you so much for this! I learn everything better by SEEING someone demonstrate a concept and then trying it myself. I am not a good book learner, especially with art. Your “submixtures” you created to solve h/c/v problems were a revelation. I’ve always blundered in with another tube color. It’s so obvious but never occurred to me! Thank you also for confirming that high chroma color value is harder to see! It confirms something I noticed the other day when I was practicing value identification on colored pencils. One question…most if the time I was able to predict your next steps. The times we differed were a couple of instances where you identified chroma as the adjustment needed, and my mind said value. Any thoughts on that? Is that likely to significantly mess up my mixing, or are we just likely to get to the same place via different routes? You’re welcome Camilla! Keeping the value constant in both your mixes, then mixing them together makes an enormous difference! Give it a go and let me know how you find it. I don’t think it should matter too much whether you’re adjusting chroma or value first, once you have the value close. You still need to do them both. I tend to default to value I think because it’s the most important of the three dimensions to get right. When I’m painting and mixing colors to match what I’m seeing, I often wind-up with the correct color, but like your demo, I only have a small dab of the correct color. Mixing enough of the correct color to actually use the paint I’ve mixed adds another degree of difficulty to the color mixing/matching problem. Do you have any thoughts on this issue besides the obvious; start with more paint…thanks. Hi Wyn. I try to mix the amount I think I’ll need for whatever part of the painting it’s for. So for a recent painting of roses, the background was a low chroma, high value blue-green. I knew I’d need quite a bit of it, so I started with a big wodge of neutral grey of the right value, then mixed a smaller blob of a higher chroma blue-green of the right value, and mixed them together till I had the chroma about right. I always have a string of neutrals on my palette, which I have pre-mixed and tubes so I don’t have to waste time mixing them up, since I always use them. You might try that. Speaking of colour matching, my New Munsell Student Colour Set continues to gather dust on the shelf where it’s been sitting for the past few years now. I can’t seem to be able to pluck up the courage to open it and try out the exercises; as if I’ll be opening up a Pandora’s Box of colour notation! It might turn out to be less complicated than the negative critic in my head wants me to believe, but I’ll only really know once I give it a try. (Your past posts on the Munsell course are great, by the way. But I still find it a bit too daunting/stressful to undertake at the moment). This excellent write-up and the accompanying demo, on the other hand, really take off some of the weight, ambiguity and stress that I’ve always felt towards colour matching/mixing. A very concise and relaxed approach you’ve presented there. I might even be getting out my oil paints soon. Thanks Nasreen, and great to hear from you! Colour is daunting! You shouldn’t feel bad about that. When you’re in that position, I think the best way to approach it is to get started with something small enough that it isn’t scary. Here’s an idea for you: Take one of the little value tags in the Munsell student book, value 5. Now use the approach I used above to match it. First, make a mixture of black and white to the right value. Place a little of it on a small piece of acetate as I did in the video, and lay it against the value tag to check it. Adjust as necessary until you’re happy. It will look a little blue against the value tag. Now mix burnt sienna or burnt umber with white to the same value. At this point, you’ll have two little piles of paint. Take a big wodge of the grey, and mix in a little – a very little – of the burnt sienna or burnt umber mix. Keep going until you think you’ve nailed the value 5 chip. If you enjoy it, do another of the value tags. Thank you for the response and extra bit of help, Paul! Will definitely follow your instructions and see how I do. You’re absolutely right about the scale factor and the practice piece vs. final piece mindset. It really helps relieve the pressure and get the creative flow going. Excellent as always Paul, thank you for your continuing efforts to help us. There really is no substitute for hard work is there, damn it! Do you know Mark Carder and his excellent site Draw Mix Paint? He has a very similar (though not identical) approach to yourself. He also has a piece on the myth of talent that I am sure you will appreciate! You are clear in the written instructions, but this video is even better: restful and very informative at the same time. I have now, at long last, got hue, chroma and value firmly in my head. That’s brilliant to hear Deborah, thanks so much for letting me know. Thanks for sharing your approach to matching a color. I agree with Deborah–this video is informative, but also restful. Your slow, calm pace is appreciated. There’s no rush, particularly since little moves can make a big difference. I’m going to try a couple of new things: Using the black window to isolate the value, and using the acetate to check the mix. One question: what do the neutrals you mix and tube yourself look like? Are they grayed down (neutral) versions of blue, yellow, green, and black? And how hard is it to tube paint yourself? The neutrals are matched to the Munsell neutral scale, 9 values from 1 to 9. Black and white are extra at either end of the range. I mix them using ivory black, titanium white (but flake is fine too) and either burnt sienna or burnt umber. If you get hold of a copy of the Munsell student book of colour, it has most of the neutral range in little paper tags. They don’t print value 1 (the darkest, apart from black) because they can’t match it with matt printed tags. Hi Paul, this is opening my eyes to thinking about colours in a slightly different way. I’m not too bad at matching colours as I’ve spent many happy hours playing around with colours, making charts etc, but making a matching-VALUE puddle to ‘bump down’ (or up) is a new one on me and I’m excited to try it. Did you make your colour isolator, and is it important that it’s of a particular value? P.S. I’ve tried it out now, and it makes a big difference keeping the chroma in mind, which I now realise I had been kind of ignoring. Thank you so much for your interesting posts, Paul, and for your clear, unrushed, steady presentation style in the video. Hi Paul! Couldn’t figure out how to post after webinar and found this great article I missed. Thank You Paul! I learned so much from this, and the demonstration,that I have been looking for all my painting life! Would love to have this on disc! Would really sell!